Kakunodate (角館) is known as the little Kyoto of Michinoku, Tohoku region. 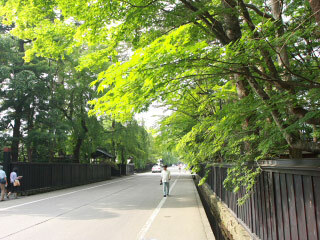 It was used to be a castle town during Edo period. There are many original Samurai Houses that constructed in Edo period, and their garden and trees are the same for over 400 years. Those Kakunodate's Samurai gardens with over 400 year-old trees are the only scenery that you can see in Japan. About 2 million visitors visit Kakunodate a year. It is one of the most popular tourist spot in Tohoku Region. Use Tohoku Express Way to Akita Express Way. Exit at Omagari. Use Tohoku Shinkansen to Morioka Station. Change Akita Shinkansen to Omagari Station.